Produced by the Kineto company on behalf of the London & North Western Railway Company in 1910, this early ten minute long film documents the workings of a typical coal mine in the Wigan area in 1910. 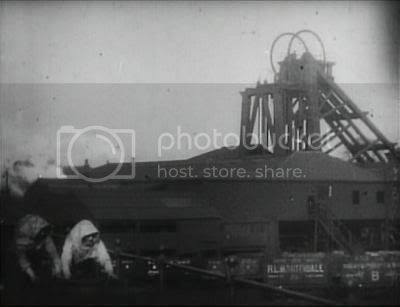 The film starts with a miner leaving his family at the start of the day, then cuts to a scene showing the pit head, complete with coal trucks and winding gear. Then, preparations for the day are shown - lamps being locked (to prevent gas explosions underground - underground mining was, and still is in other countries, dangerous, and disasters with high death tolls were common), and then the miners descending. Staged scenes filmed above ground for the purposes of the film give an impression of the cramped conditions experienced working at the coal face, cutting coal and placing it in a wheeled tub to be taken to the surface. Then, the tubs are brought to the surface where they are showed being taken out of the cages and wheeled away by boys. Several minutes of the film is then devoted to showing the women workers of the coal mine, both young and old, wearing long skirts and with distinctive shawls worn tightly across the head and shoulders making a sort of hood and scarf combination. A large extent of their work is shown - from pushing the heavy tubs of coal around, to sorting it and loading wooden props for use underground. 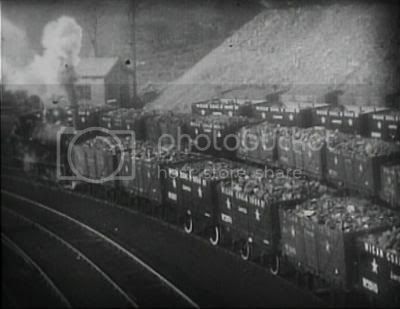 The end of the day is then shown, with the male coal miners coming to the surface and receiving their pay, as well as long lines of railway trucks loaded with coal departing the mine for travel to its final destination. The second to last scene shows the coal miner from the start of the film returning to his family safely after a day at work. The final scene shows the end product - a cosy fireside, with a middle/upper class family sat around the fire while the maid puts more coal onto it, and the family then enjoying the heat from it.